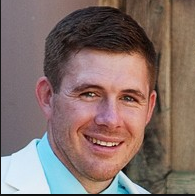 Carter Unger took over the CEO role at Spring Creek Development after the death of his father, Fred, in January. Fred was the founder of the company, which specializes in the development of signature real estate projects such as the Hermosa Inn in Paradise Valley, the Royal Palms in Phoenix and SouthBridge at the Scottsdale Waterfront. Carter now is following through on a project his dad has been working on for many years: the redevelopment of the SouthBridge area. The project, which runs from Goldwater Blvd. to Scottsdale Road along the canal and to the south, is nearing ready for public review and ultimately City Council action. It is a mixed-used project with retail, residential, restaurants and office space. Carter described it as a project that is intended to breathe new life into Old Town while melding with the culture and history of the area. 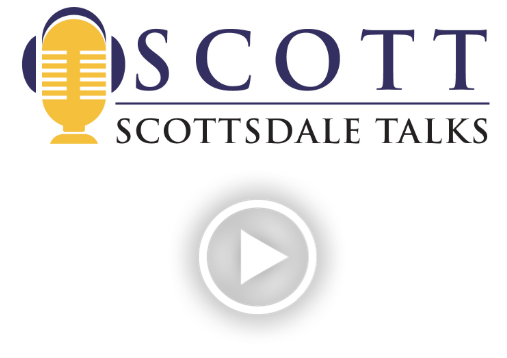 Kevin Maxwell, working with SCOTT, sat down with Carter recently for a question and answer session on the project in a new podcast series being introduced today: “Scottsdale Talks.” Here are two highlights of their conversation. If you’d like to participate in “Scottsdale Talks” or have a suggestion for someone you’d like to hear from, just let us know by emailing donh@scottsdale.com. 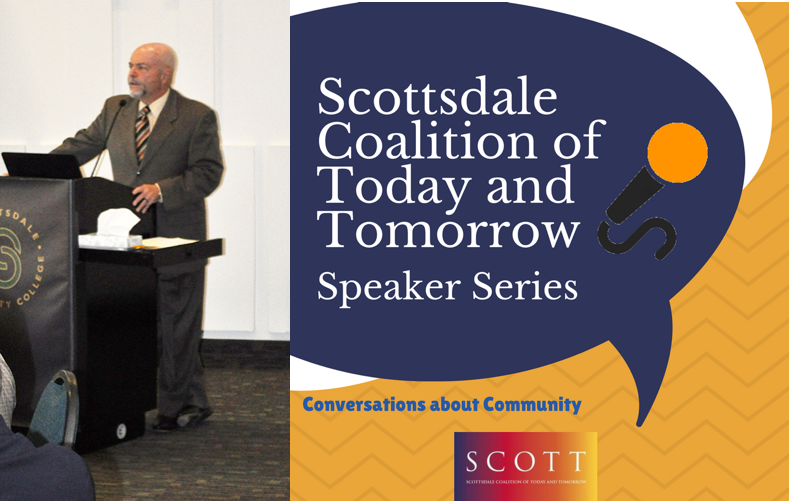 Scottsdale’s infrastructure and capital improvement needs and financial solutions were the topics of the recent Issues & Experts forum co-hosted by SCOTT. The City Council has decided to ask voters in November to approve a .10 percent increase in the city’s rate, which currently is 1.65 percent. This action was to ensure the city is eligible to collect nearly $170 million in matching regional funds from the county. The council intends to pursue a bond issue to fund capital improvement and infrastructure costs for possible voter approval in 2019. We will be examining various aspects of this issue over the next few weeks. Today: The difference between sales taxes and bonds. Scottsdale’s sales tax is 1.65 percent, among the lowest in the Valley. If voters approve the increase in November, the city will receive 1.75 percent for 10 years. It will generate an additional $10 million annually for transit purposes during those years. The sales tax is one means for financing city services. Of Scottsdale’s sales tax revenue: 1% goes to the General Fund, .2% goes to transportation (per 1989 voter approval), .2% goes to the McDowell Sonoran Preserve (per 1995 voter approval), .15% goes to the McDowell Sonoran Preserve (per 2004 voter approval) and .1% goes to public safety (per 2004 voter approval). Scottsdale continues to maintain the highest possible rating from the three major national bond rating agencies. Scottsdale issues debt in the form of bonds to ensure the city’s assets are maintained and for other capital improvements. Issuing bonds allows the city to meet infrastructure needs while paying for the assets as they are used. Scottsdale has General Obligation (GO) Bonds and Municipal Property Corporation Bonds and/or Water Reclamation (MPC) Bonds. They are two of the funding sources for the city’s Capital Improvement Plan. GO bonds are voter approved and are usually issued to pay for general capital improvements such as parks and roads. MPC is a non-profit corporation established to issue bonds to fund city capital improvements. Voter approval is not needed as pledged revenue streams—e.g., water and water reclamation rates, finance repayment of MPC debt. The CIP provides the basis for control of expenditures for the acquisition of significant city assets and construction of all capital facilities. Next up: What it takes to stay even with the city’s capital needs.